Homegrown Renewables on the Menu for Cities | Broadview Collaborative, Inc.
There’s been a growing interest in the potential of sewage as a supply of renewable energy for urban areas, a source we’re only beginning to tap. (See, for example, this recent piece from Water Innovations http://bit.ly/1wV2UV1). Wastewater treatment plants, or resource recovery facilities as they prefer to be called these days, are increasingly seeking ways to get more and more high strength waste (i.e. biological waste) into their facilities so that they can extract the energy from it in their anaerobic digesters. But wastewater utilities aren’t the only game in town. There are others who want a piece of the waste pie. Oshkosh Wisconsin, aka “Sawdust City”, is situated squarely in the middle of America’s heartland in more ways than one. But if you think that means small town thinking, you better redefine what you think of the heartland. The city is home to the University of Wisconsin – Oshkosh which has invested in a number of food and agricultural waste-to-energy projects, including this relatively simple-tech dry digester that collects farm and kitchen waste in a large warehouse designed by BIOFermTM. As the food ferments, gasses released by the decomposition, largely methane, are captured in a large bladder built into the ceiling. 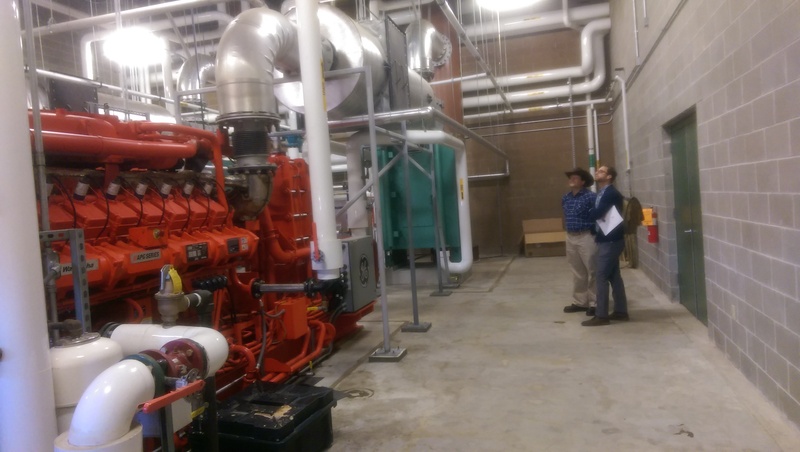 Each day the full bladder is then evacuated, the gas is scrubbed of contaminants and the resulting methane is used to create electricity and heat for the university. At last count, this renewable source was providing about 8% of the university’s electricity. This is but one of three projects the university has invested in, leading the way for other communities in Wisconsin to do the same. But Oshkosh isn’t alone in the state. Right in the heart of Milwaukee, a stone’s throw from city parks and a large casino/hotel complex, sits the FCPC Renewable Generation Biodigester Facility, a two-megawatt biodigester, churning out electricity and heat from what would otherwise be waste products. Last fall Brent Shraiberg and I had the chance to tour the facility with interim plant manager Dan Kegley. One of the first things I noticed was how unassuming it was. Nestled in the bustling Menomonee Valley, it looks not unlike the buildings of many of the other industries nearby. It’s quiet and, despite all of the organic matter and fermentation going on, has no odor. None. Tanker trucks come in and out to deliver the materials that make up the feed stock, but otherwise it’s quiet and unobtrusive. We started our tour in the receiving bay where pumper trucks carrying anywhere from four to six thousand gallons of material arrive to offload. I asked a few of the drivers what they were bringing in: waste from cheese factories (it’s Wisconsin! ), corn syrup left over from ethanol production, grease and other food byproducts from local restaurants. 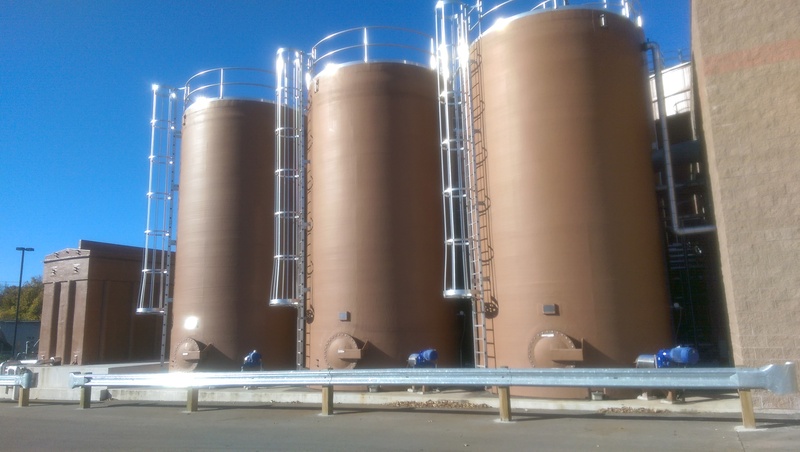 They deposit into one of six holding tanks, and from there the various products are combined into an equalization tank, and eventually into the digester itself. I found it interesting that, not unlike a sewage treatment facility, they have to filter the material before sending it to the equalization tank because they never know what surprises lurk in the liquid waste (spoons, gloves, etc.). The facility operators are regularly testing the composition of the materials coming in to make sure that they have the optimal mixture for creating methane. Dan, our host, likened it to being a chef, trying to get the recipe just right, but I’d say it’s like a chef with only the vaguest of ingredient labels. As the methane is produced, it runs through a series of scrubbers to remove hydrogen sulfide, which can create sulfuric acid and degrade metal parts downstream, and accompanying odors. The treated biogas, a mixture of methane and inert carbon dioxide in a roughly 2:1 ratio, then runs through a large engine generating about 2 MW (about half the power of a locomotive) of electricity for the grid, along with 4-5 million BTUs/hour of heat which is used by the nearby hotel and casino (a block or two distant) for hot water and heating needs. The facility was built and financed by Greenfire Management Services, LLC, which is wholly owned by the Forest County Potawatomi Community (FCPC), and is managed on contract by Natural Systems Utilities, LLC, a New Jersey firm that has been designing, building, and operating sustainably systems for nearly thirty years. Sources of revenue for the facility include tipping fees paid by the waste haulers who use the biogas facility as an alternative to the dump, and the sale of electricity (some of which occurs during the higher value peak hours) to WE Energies. The heat supplied to the casino and hotel obviously has value, but FCPC does not monetize that transaction. The facility is run by one manager and three operators. As byproducts, the facility also creates partially treated wastewater and a composted residual. In Milwaukee, the wastewater goes into the sewer collection system but in regions where water has a higher value it is entirely conceivable that the water could be another source of revenue. Currently the solid residues are landfilled, but it seems likely that these also have value and, in time, will find a higher value application. We hear a lot about wind and solar as important sources for reducing our dependence on fossil fuels, and for bending down the curve of greenhouse gas emissions, but what about urban biogas facilities? After the tour Brent and I headed over to nearby Sobelman’s where he told me that he thinks there is no shortage of investors and dollars ready to back more facilities like the ones in Oshkosh and Milwaukee. The stumbling block, as he sees it, is everything else. Our system of planning, permits, and regulations are not yet aligned with our need for sustainable solutions, and our cities don’t yet have their sights set on these solutions. Leaders like UW-Oshkosh, Greenfire Management Services, and Natural Systems Utilities are pioneers, blazing trails that will make it easier for others to follow. I just hope that the next wave of settlers comes through quickly and we can establish a clear path for others to follow.